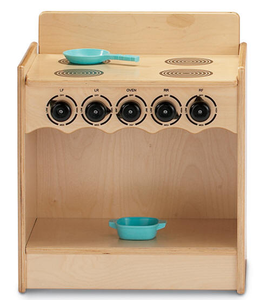 How about this spiffy new design for toddler kitchens! These pieces include features that will delight toddlers! The refrigerator door actual opens and closes, knobs turn on the stove, and the sink features a realistic faucet! Kickplates an all cabinet-style units prevent toe and finger pinching and small objects can't get underneath!